These products can supply clean and efficient thermal energy in various sites. By firing fuel in a gas turbine exhaust conducted to the wind box, RPG re-powering burners provide supplemental heat to a fired boiler so as to generate more steam in cogeneration systems. 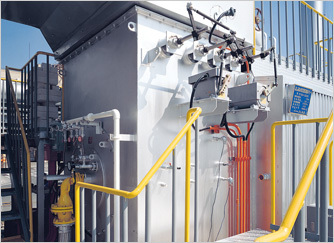 This application is suitable for any type of plant where a great deal of steam is demanded. Secondary and tertiary air annular throats with swirlers are furnished around the primary air throat in order to attain a stable combustion. The wind box is divided into three air passages, in that, for high load combustion, the first and second stage are fully opened and the remaining third stage is fully closed, and for low load combustion, the first and second air passages are partially throttled according to load change and the third air passage is fully opened for bypassing the turbine exhaust to the boiler furnace. Likewise, for fresh air running when the turbine is shut down, only the fist stage air passage is opened and the remainder are fully closed. 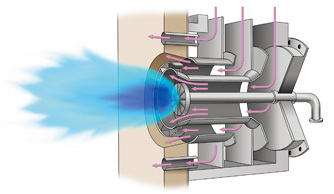 This configuration ensures a high turn-down ratio of stable combustion. In fresh air mode, this enables stable burning at a low wind pressure of the fresh air blower. Fresh air firing is possible while the gas turbine is shut down. Low excess air operation of 3% O2 available throughout the turbine load. Retro-fitting is possible with existing boilers. Single to Multiple burners arrangement are available.